Welcome to the Redwood National Park Information Page. Redwood National Park is located on the northwest Pacific coast of California, between the cities of Klamath Glen on the north and Trinidad on the south border or the park. The Park is situated along a long, narrow stretch of northern California coast, nearly abutting Oregon. The closest major airport is Sacramento, California and there is a smaller airports in Eureka and McKinleyville, California. 1. Take Highway 101 South to the park. 2. Take Highway 199 South to the park. 1. Take Stateroad 299 West to the park. 2. Take Stateroad 36 West to Highway 101 North to the park. 1. Take Highway 101 North to the park. 2. Take I-North to either Stateroad 36 West or Stateroad 299 West to the park. Visitors can make arrangements to fly into the Eureka-Arcata Airport, located in McKinleyville, 28 miles south of Redwood Information Center, or into the Crescent City Airport. Car rentals are available at either location. Greyhound Bus Lines passes through the park two times each day traveling north and south. The Redwood Coast Transit system provides access to some trailheads near Crescent City. Once in the park foot, horse, and bicycle trails expand the travel possibilities. Redwood National Park was established on 02 October 1968 and expanded on 27 March 1978. Redwood National and State Parks protect old growth coast redwoods, some of the world’s tallest trees. Less well-known are the prairies and oak woodlands and the coastal and marine ecosystems. Three California state parks and the National Park Service unit represent a cooperative management effort of the National Park Service and the California Department of Parks and Recreation. Together these parks are a World Heritage Site and International Biosphere Reserve protecting resources cherished by citizens of many nations. Old-growth forest federal acreage is 19,640, with the state having 19,342 for a total of 38,982. Visitation to the park is highest in June, July, August, and September and lowest in January with total recreational visits in 1999 at 369,726. The ancient forests of the Pacific Northwest, containing as many as 25 different species of conifers, are dominated by only a few. Sitka spruce dominates southeast Alaska and coastal British Columbia, while Douglas fir dominates in Oregon, Washington, and inland British Columbia. The stately coast redwood (Sequoia sempervirens), largest of all, dominates in northern California. Burls in coast redwood are masses of stem tissue where elongation of the many stem tips has not occurred. They are anatomically similar to tissues in eucalyptus called “lignotubers” by the Australians. Burls develop from axillary buds in the seedling redwood. This “basal burl” (sometimes called a bud collar) persists, growing larger throughout the life of the tree. The dormant stem tips continue slow growth and branching, but do not elongate. Unlike aerial stems of redwood, burl tissue grows downward. It forms an enlarged mass near the base of the tree above or below the soil surface. Burl tissue overgrows the root tissues at the base of the tree. Burls may also occur well up the main stem and on branches. A variety of wildlife species call Redwood National and State Parks home. The diversity of ecosystems in the parks means that creatures as different as black bears, sea stars, and bald eagles can be seen by a lucky visitor in a single day. In addition to the more common inhabitants, many threatened and endangered species rely on the parks’ old-growth forests, open prairies, estuaries, and the coastline for crucial havens of survival. Marine mammals such as sea lions and gray whales are among the most visible wildlife in the parks. Visitors are also likely to see Roosevelt elk browsing in the prairies. Pelicans, ospreys, and gulls are frequently spotted along the coast. Of course, tidepool creatures aren’t likely to run very far at your approach, so anenomes and crabs are easy to spot too. While you’re out watching wildlife, remember that all wildlife is protected in the parks. Never feed or approach animals such as bears, mountain lions, elk, chipmunks, racoons, or rabbits. Please treat the members of this natural community with respect. Rocky and jagged, coastline is a meeting place of ocean and continent where a unique collection of life has adapted to the harsh environment. Buffeted by the salty sea winds, salt-tolerant vegetation springs up among the beaches and steep cliffs that dominate this stretch of California’s North Coast. Among the seastacks, brown pelicans and seals find a comfortable home; crabs and colorful anemones crowd the tidepools along the sea’s edge. Despite the extreme nature of fierce ocean winds, pounding waves, and geologic instability, visitors will find this pristine coastline an enchanting, unexpected part of your Redwood National and State Parks experience. Rivers at Redwood National and State Parks are world-renowned for fishing and no less loved for recreation and sheer beauty. The Smith River, named for explorer Jedediah Smith, arises in the Siskiyou Mountains and flows through the parks’ north section. It is now California’s last major free-flowing river and is famous for salmon and steelhead. The Klamath River, also a salmon and steelhead river, crosses the midsection of these parks. Redwood Creek flows through the parks’ southern section. All information centers are physically accessible to wheelchair users. Wheelchairs are not available. Backpackers along the Redwood Creek Trail must secure a free permit at any information center within Redwood National and State Parks. A fee is charged ($3.00 per person) for the backpack sites in Prairie Creek Redwoods State Park. Animal-proof food canisters are available to borrow free-of-charge at Redwood Information Center. There are 16 miles of national park trails and 40 of state parks are available to bicycles. There are no developed campgrounds in the Redwood National Park. There are no entrance fees for Redwood National Park sites. There is a $5.00 day use fee in developed areas at Prairie Creek Redwoods State Park, Del Norte Coast Redwoods State Park, and Jedediah Smith Redwoods State Park. Fishing is allowed in Redwood National Park. For information on gas and other supplies near Redwood National and State Parks, call the Chambers of Commerce at Orick or Crescent City. From south to north in the Redwood National and State Parks region, gas and food are available in Eureka, Arcata, McKinleyville, Trinidad, Orick, Klamath, and Crescent City. 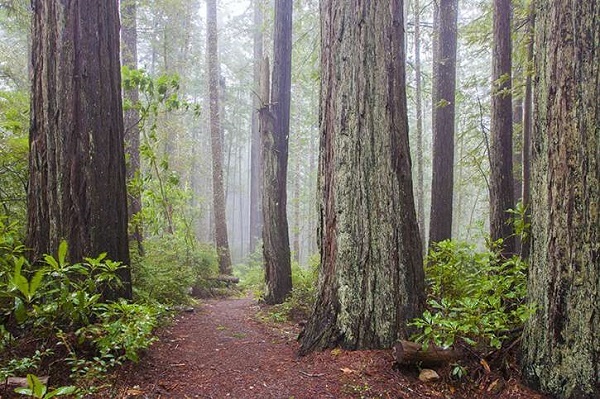 A wealth of trails exists in Redwood National and State Parks. There are 56 miles of foot trails in the national park and 108 in the state parks; 16 miles of national park trails and 40 of state parks are available to bicycles and 41 miles of national park trail are available to horses. Backpacking is also an option. Redwood Hostel offers lodging within Redwood National and State Parks. For information on lodging near Redwood National and State Parks. Dogs were among the first wild animals domesticated by humans. We enjoy their companionship and affection as well as appreciate their practical skills (protection, searching for lost hikers, leading disabled people, herding). Our relationship with our dogs often brings out a natural protective instinct in them. This can threaten other people. A misinterpreted friendly hand can lead to a bite. Pets are also allowed at Point St. George and Lake Earl State Wildlife Refuge near Crescent City and in the nearby Smith River National Recreation Area. Pets are permitted along spacious Clam Beach a few miles north of Arcata south of Redwood National and State Parks. Redwood National Park has three visitor centers; Crescent City, Hiouchi, and Redwood. Summers are generally mild. Fog is often encountered near the coastline, with sunny, warmer weather more common inland. Winters are generally cool with considerable precipitation. Wear layers of clothing to accommodate cool to warm temperatures and good walking shoes. Rain protection should be included at any time of year.